Our swim hats are made of high quality chlorine resistant stretch nylon knit – perfect for the pool! Swim hats are best for use in a wet environment - at the beach, lake, swimming pool or splashing about under the hose! If you are looking for a hat for everyday use - we always encourage using our Cotton hats instead (all our hats excluding our range of Swim Hats). A cotton rich hat will be much cooler for everyday use. ‘Waves’ is a limited-edition design in our 2016 Spring/Summer collection and is also available in the Swim Legionnaire style. BEST SUITED TO: Fully mobile children no longer requiring a stroller – walking, running, non-stop play in a water environment. Need help? Watch our video on how to measure your childs head, alternatively, email us at info@nest2me.com.au we'd be happy to offer advice. IMPORTANT: For best fit, measure child and purchase the closest size. Our hats are stretchy. 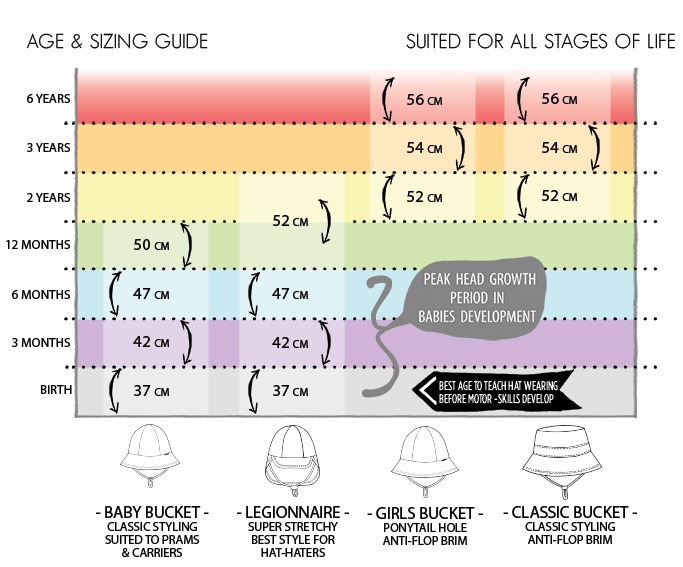 Checkout our sizing tips below. Our unique 'anti-flop brim' designed for serious fun! One fact you can be sure of - no two heads are the same! ALWAYS measure your child's head before purchasing to ensure getting the accurate size. STEP 1: Distract the child with a toy or food (so they dont try to help you!). STEP 2: Use measuring tape to take measurement. Otherwise use a ribbon to take the size then use ruler to find the measurement. STEP 3: Purchase the size closest to your childs measurement. Our hats are very stretchy and will grow up to 5cms. For Example: The child measures 41cms, you will need the 42cm size that will stretch another 4cms up to 46cms - giving plenty of future wear. Purchasing the next size up would be too large and block child's vision.